The Bosch GOP 10.8 v-LI Multi Cutter is an unusual tool to feature within the magazine, but as people venture more and more into enhancing their work; traditional working methodology and finishing practices may not be sufficient to create the effect required. This cordless Multi-Cutter from Bosch is one such tool that may well help. Cordless tools are definitely being more widely used and this one cannot only be used in the workshop but also around the home. 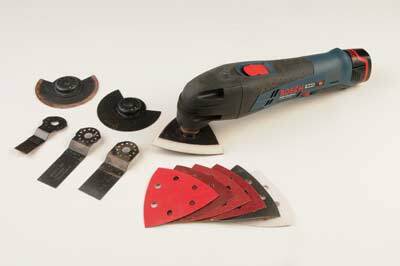 Various accessories allow it to be used as a sander, cutting tool, chasing tool, etc. To use as a sander you can fit a triangular hook-faced pad to the front of the tool and adjust where the facets are positioned, which allows you to sand up to hard, clearly defined edges as well as in very tight spots. If desired, you can, as long as you don't cut into the dust extraction holes, modify the shape of the pad to suit your needs. The variable speed can be adjusted to a very fine vibration with minimal pad movement through to fast, with plenty of vibration/oscillation movement. Depending on the speed setting and abrasive used you can have fine controlled material removal/refinement through to aggressive fast material removal. The cutters that can be used with it can cut slots, channels and grooves, as required. The tool is well balanced, easy to use and operate. The 10.8V battery unit packs a hefty wallop and was great for everything we have used it for in the workshop. 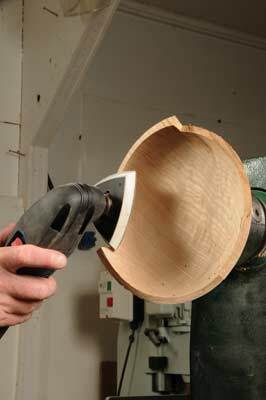 Versatile, yes, a turning tool, no, but definitely a valuable tool to have in the workshop. It is one of those tools that I wish had been available many years ago and am finding more and more uses for it as the weeks go by.